Through July 13, you can get this $1,200 Livestrong LS13.0e elliptical cross-trainer at Amazon for $904. Right now you can get a fan-dam-tastic deal on a Livestrong LS13.0e Elliptical cross-trainer at Amazon. These MaxTone pedals on the LS13.0e are supposed to be great for natural foot movement and cushioning. The LS13.0e console has a backlit LCD plus 2 LED feedback windows for tracking your progress. The machine itself just dropped about $100 in price, from $1,225 to $1,105. I have no idea how long this price drop will last. I've had my eye on this elliptical for a while now, and this is the first time I've seen the price that low. It's been steady at $1,225 at Amazon, and it sells for $1,199 at the LiveStrongFitness site. But on top of that, Amazon is running a 20% off special when you use your Amazon.com Rewards Visa card. I got this card a couple of years ago purely because of the occasional promotions they run like this. Well, I wasted no time in convincing hubby to let me get this thing while the getting was good. I ordered it yesterday, and it should be here in a few days. 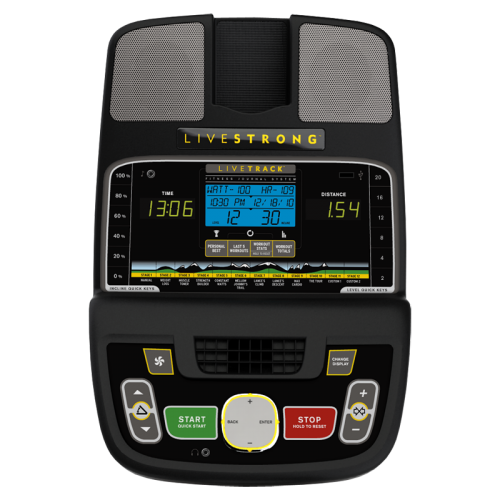 The Livestrong LS13.0e was on my short list for several reasons. First, the 30-pound flywheel. Everyone who knows ellipticals knows that a heavy flywheel is the key element that determines whether an elliptical has a jerky motion or a smooth, pleasant motion. Some of the other elliptical trainers claim to have a "heavy-duty flywheel," but when you check the specs carefully, it's a "heavy-duty 14-pound flywheel" or a "heavy-duty 20-pound flywheel." At 30 pounds, the flywheel of the LS13.0e is in fact heavy duty. You don't generally find flywheels that heavy until you get into the $1,500 and up price point. The cushioned, arched Maxtone pedals are another strong selling point for me. Here's what Livestrong says about the pedals: "The arched design of the MAXtone™ pedal utilizes the science of balance training to uniquely recreate a walking or running motion. Your foot flows through the motion just as it does when walking on sand -- your heel contacts first, then rolls up to the toes for push off. This eliminates the "tingling foot" sensation found on other ellipticals, and initiates core activation. The gel cushioning provides additional traction and shock absorption." I have minor plantars fasciitiis, and I really need pedals that will be kind to my feet. These sound like possibly the best pedals on the market. Also, the pedals are right next to each other, with no gap in between, which should be much kinder to my knees than those ellipticals with an 8" or 10" gap between the pedals. 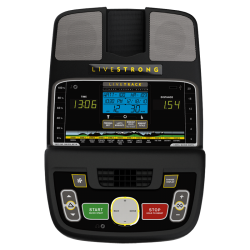 Amazon is currently selling the Livestrong LS13.0e for $1,105, but when you use your Amazon Visa card and enter the promo code JULGET20 you get an additional 20% off, making it $904 delivered to your door. 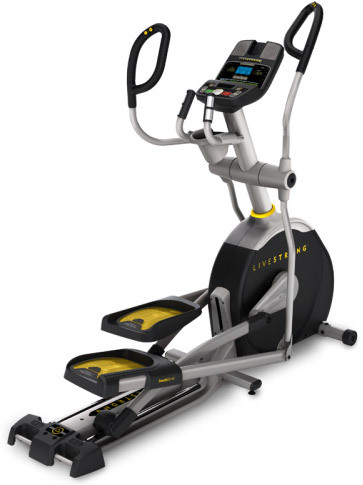 The third thing that appealed to me about this particular Livestrong elliptical is the repeated mention in the reviews about the quality construction. 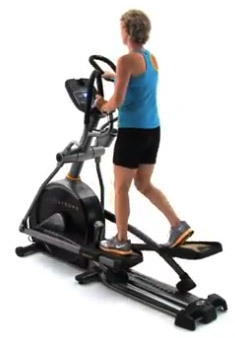 One reviewer wrote, "It was the first elliptical I had tried outside of the gym that felt really good." Another: "The build quality is excellent." There are many such references in the reviews. I knew I didn't want one of the low-quality $500 ellipticals; I really wanted the LS13.0e and was having trouble justifying $1,200. 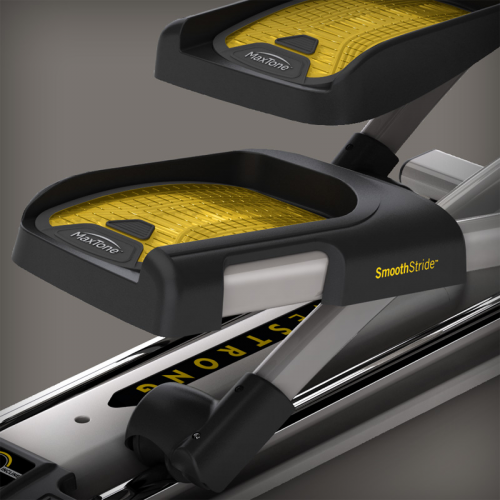 The power incline adjustment is a nice feature, since you can adjust the incline on the fly during your workout. This feature wasn't at the top of my list in terms of importance, but I'm sure it'll be nice to have. The LS13.0e has "quick keys" for both incline and resistance for on-the-fly adjustment. I'm sure I will like that ability. The Livestrong interactive technology feature should be very nice. The trainer comes with a USB device that you can use to upload your workouts to Livestrong and keep track of your progress. You can also download new workouts from Livestrong, to get variety in your fitness program. Nice to have, but I don't know yet if this feature will really matter to me. Stride length of 20 inches: check. 12 workout programs, including being able to create your own custom workout program: check. Built-in fan and speakers for your iPod: check. Lifetime warranty on the frame and brake, and 5-year warranty on other parts: check. Based on the reviews, I don't expect the console readout to "wow" me. That's okay. The heavy flywheel and quality construction are much more important to me. I don't need or care about having a gaming-quality electronic display. One popular review site names the LS13.0e as the "best buy" in the $1,000 to $1,299 category. It's hard to imagine getting a better buy than getting that $1200 elliptical for $900. If you've been wanting the Livestrong LS13.0e Elliptical, get thee to Amazon right now. The 20% off is only through July 13, and I don't know how long the $1105 price will last. Savvy Consumer on All Lasagna Pans Are Wrong…. Or Is It Just Me? Geoff Mentus on All Lasagna Pans Are Wrong…. Or Is It Just Me?